The Shopasaurus, popular 80's icon that has faded into the past. Funny thing about Web search — not everything shows up just because it’s out on the Web. You’d think that by putting a site up Â with Saurus characters, that if you searched Google for “shopasaurus” that my little pink dinosaur would appear in the results — not so. Web experts use techniques called SEO (search engine optimization), which get the thing you want people to find to show up higher in the results. But shopasaurus didn’t show up at all. There’s a lot of technical reasons for it, but one thing that helps, is if I post it on this site, which has been around a lot, and has a lot of outgoing links. 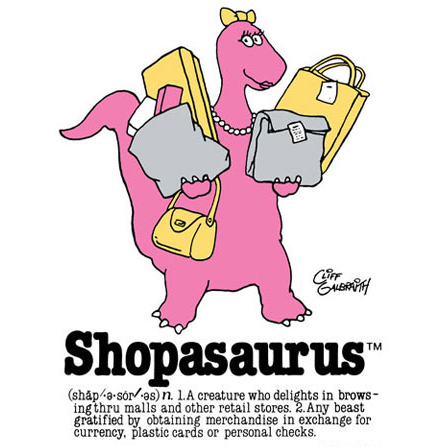 Â So here be Shopasaurus, that 80’s icon of excess. 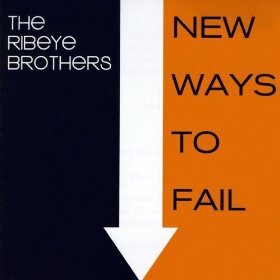 I’ll post more here about The Ribeye Brothers “New Ways To Fail” release here later. For now, just know that it rocks. Not much does these days. There’s a lot of good new music out there, but rock is rare. Some of the best garage rock I’ve heard in ages. Outstanding!!! 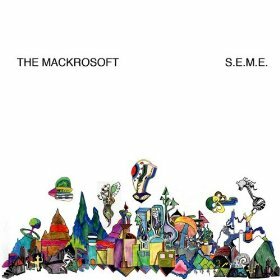 The groove is strong with Mackrosoft, the 27 piece project that evokes 70’s keyboards, horns, and wah-wah peddle guitar. Much thanks to Wax Poetics magazine for hipping me to this disc. 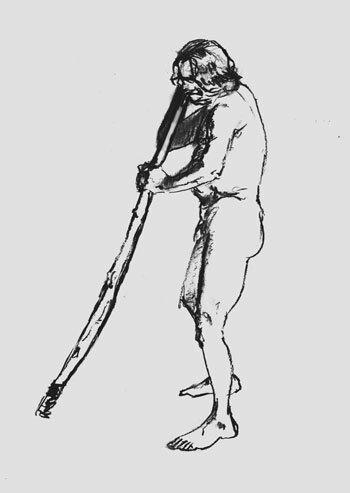 I was always a guy who could draw — not great, just better than the average human. At different times in life, I’d make huge leaps in my ability or technique, other times, not so much. I studied life drawing here and there; I learned it in my first year in art school at Du Cret, and in 1987 I went to SVA at night to tune up my skills a bit. Nothing great, but enough to get by. There are certain times in our lives (if we are lucky) when our eyes are opened for us by someone who sees some talent in us, but knows that we could be Â better. Tim Gula was that person. He would repeatedly phone Â me to go drawing with him everywhere from the Los Angeles Zoo to Â The Art Center College of Design, Pasadena. 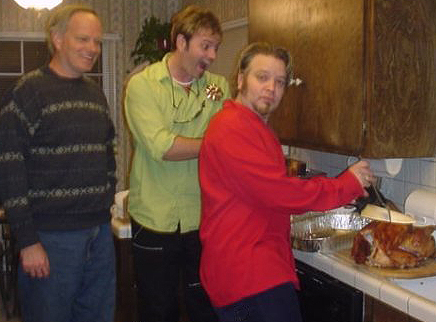 I didn’t take full advantage of his wealth of knowledge, and I didn’t entirely appreciate what it was that he was trying to instill in me at the time. But he did get me thinking about drawing and creating in a different way. He forever ruined my tolerance for my own output. What I was drawing, how I was drawing could always be better. 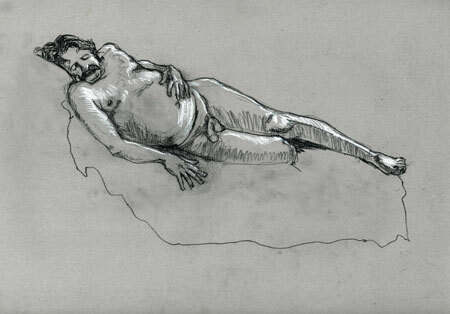 Now it is years later, and I am once again going back to a drawing studio for life drawing. As others in the room move about trying to get the correct angle or right lighting, I just set up anywhere. When asked how long I’d like the pose to be or if the lighting is okay, my response is, “it doesn’t really matter — I’m not here to make art, I’m just here to draw.” I’m really doing it to learn, to experiment, to understand. I have a long way to go. Fortunately, I’m in a studio with a good group of artists, and I look forward to every Sunday afternoon. With some perseverance and dedication, I look forward to posting some noticeable progress that even Tim Gula would approve of. Stay tuned. Now I know how rock stars feel when fans insist they play their hits. 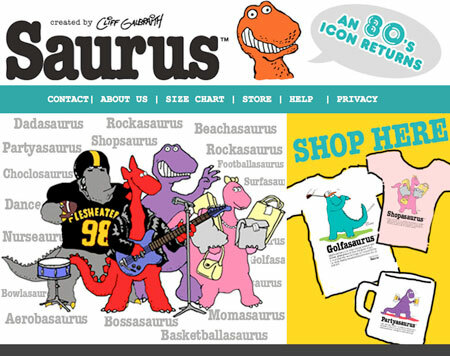 I created Computasaurus, Shopasaurus, Partyasaurus, et al back in Feb. 1986, and some 23 years later I still get requests for Saurus shirts, coffee mugs, plush toys, etc., especially Dadasaurus. I’m currently working on a completely different project, so to spend time on launching this new site, with our partners Digital Imagining Services of Spring Texas, really brings me back to the days when Saurus was the top selling T-shirt line in America. Many times I’ve tried to put Saurus in my past and move on to something grittier, something more challenging. But what I realize about the simple little Rockasaurus and Beachasaurus, is that they gave me the life and career I have today. I’m able to create what I want because they gave me the confidence and the freedom to go wherever my imagination takes me. Thanks Saurus.